A true delight for me on this trip was meeting up with a beloved university professor for lunch in Pienza. While the meal was less than inspiring, what was as rich as our conversation was the olive oil. A bright green oil was poured over some crushed chilli flakes to enjoy with bread. Like many, we use olive oil regularly and, aside from some high end samples brought home by Chef , we typically find a good value olive oil for everyday cooking. What we dipped our bread into that afternoon was a bouquet of bitter earthy flavours in our mouth. Already the oil was a year old, but because the farm picks their olives early, they produce rich extra virgin oil that boasts its signature lime green colour and rich aromas. When Chef tastes something new and exciting he wants only one thing- to learn more about the product and to get his hands on some to bring back home. He was, therefore, thrilled when the restaurant’s manager invited us to Podere Spedelone, the agriturismo, just 20-minutes down a long gravelled road outside Pienza. Podere Spedelone has some of the oldest known olive trees on their five hectare farm dating back to the 15th century. The day we visited, a team of farmers were manually picking the olive trees. I enjoyed my first olive oil tasting and found it remarkable how much flavours vary year to year much like a wine. Their trademark is to press the olives on the same day they are harvested. The agriturismo does not commercially sell its oil and uses it for their restaurant and for their guests to purchase. The kitchen team at Podere Spedelone continually work to perfect new recipes for using the olive oil in as many delicious ways as possible. Eloise slurped down a scoop of ice cream drizzled with olive oil and pink peppercorns and eagerly asked for more, please. 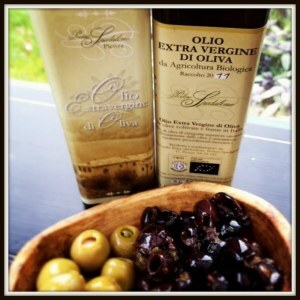 Perhaps olive oil should replace chocolate syrup at our home? We spent over two hours at the farm and helped feed dinner to the resident Tuscan cinta sense pigs, gathered olives with the pickers and soaked up the Tuscan sunshine in our new found oasis. Our host was most gracious and paid no mind to the passing time even with us arranging our visit just 30-minutes before arrival. We drove back to Castellina with the Tuscan sun setting behind the hills with a dozen rattling bottles of olive oil, promising to keep a lingering flavour of this magical afternoon on our lips.